Being a well oiled, cooking machine. Go ahead, try just one. A ritual for my wife Megan and I, is to get there an hour before our reservation to have a cocktail before dinner, along with the company of a knowledgeable bartender and an endless supply of spiced cashews. This post is not a review of the great steakhouse in Silver Spring, Maryland. Nor is it a post on cooking steak. 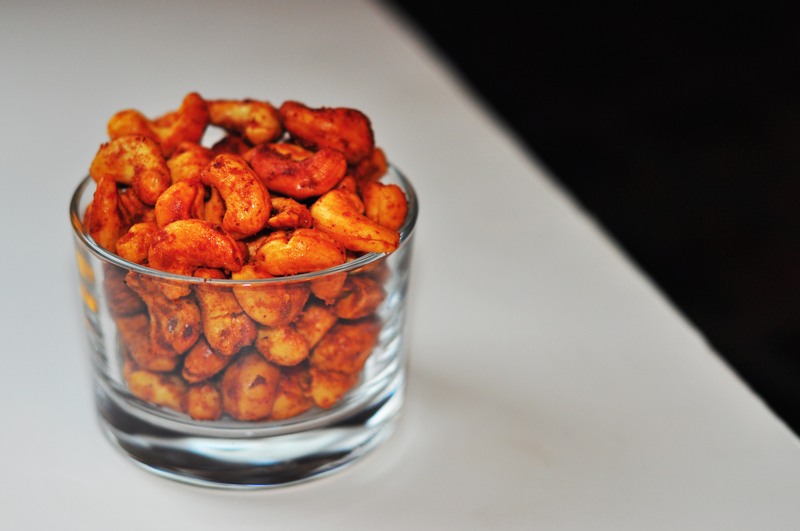 This post, my friends, is on one of those little things that help make Ray’s the best steakhouse in the land: cajun spiced cashews. Yes, everything else about Ray’s is off the freakin chart, but these little spicy/crunchy bites take it to another level. It IS the little things. Via multiple trips, excessive tipping and persistent questioning about these spicy concoctions, no recipe has been disclosed. The only tidbit of insight came along with a fresh scoop of them and a wink. It was whispered: duck fat. So, after bowl number two and a perfectly white napkin now stained with red fingerprints, it is off to have a great steak and think about cashews some more. I have made multiple attempts at recreating these nuts and believe I am as close as I can get without “being told, then killed”. They are a perfect Holiday snack or prequel to a good steak. Preheat oven to 350. In a small sauce pan, melt duck fat or butter over medium low heat. Add all ingredients except for the cashews into the saucepan. Whisk until combined and remove from heat. In a large mixing bowl, toss the cashews and the contents of saucepan together until well coated. 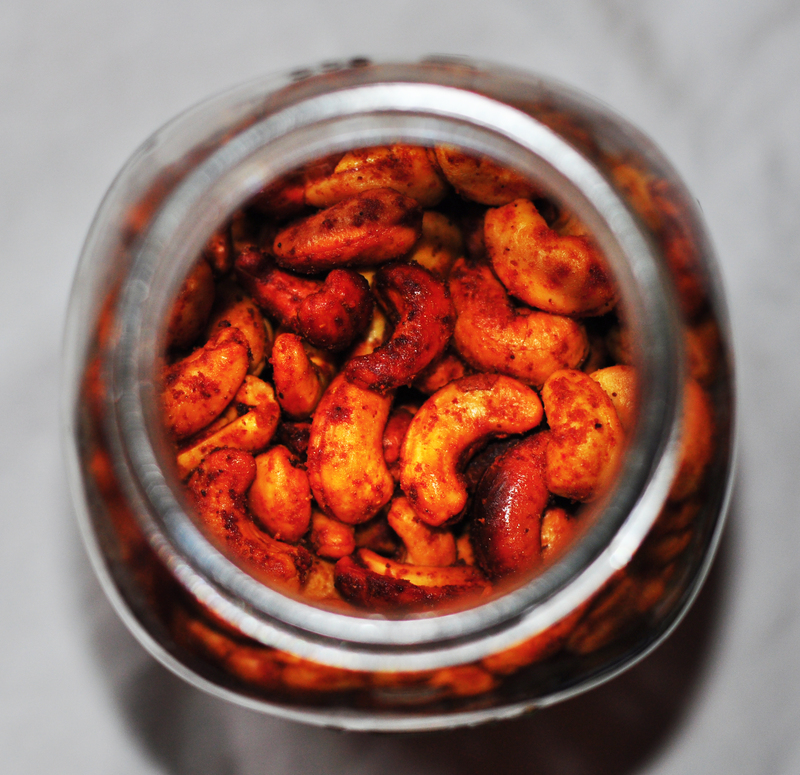 Spread coated cashews in one even layer on a baking sheet lined with foil. Bake at 350 for 10 minutes. Remove from oven and toss the cashews around to ensure even browning. Put them back in the oven until they turn a light golden brown (about 10 more minutes). Keep a close eye on them as they can burn very quickly. Let cool at room temperature for 10 minutes and watch them disappear… Have bleach ready if you have your nice white napkins out. It was a quiet Tuesday, until I got a post on Facebook from the New Belgium Brewing company. Nevermind the earthquake we had or the hurricane that was on the way; they started selling Fat Tire beer in Maryland! My favorite beer, that I have traveled far and wide to get, is finally available in my home state. I first discovered this tasty brew when I was in college. At that time, Fat Tire wasn’t distributed anywhere east of the Mississippi River. From Carbondale Illinois, we would drive to Missouri to get a keg of it for special occasions (birthdays, end of the semester, etc). Other than that, I had to rely on the rare occasion that someone would visit me from where it was sold, and hope they remembered to bring me some. 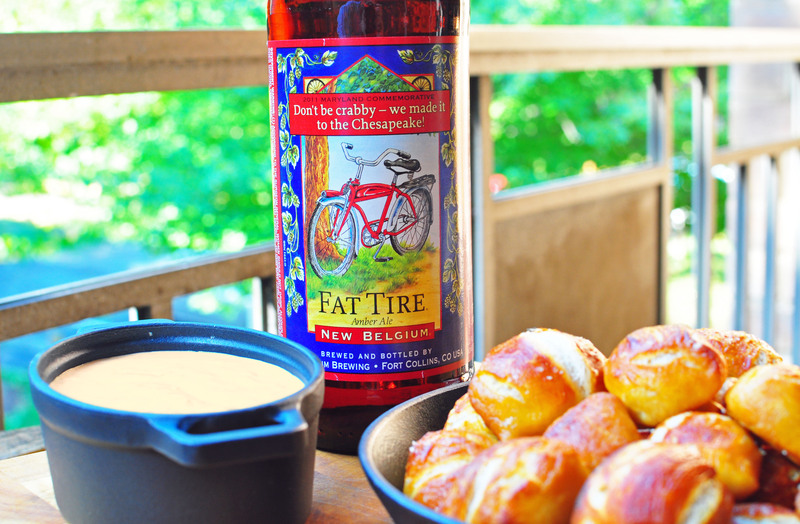 There are several flavors of beer that New Belgium makes, all of which are good, but the toasty amber ale that Fat Tire is rings my beer bells. If you can get it, buy some today (no, I’m not getting paid to say this). To celebrate the new arrival I decided to combine two of my favorite things: beer and cheese. Home made soft pretzel bites and beer cheese dip to be exact. Obviously, this snack is good for just about any situation, such as breakfast, lunch or dinner. Just be sure to have a cold frosty one to wash it all down with. In the meantime, turn the dough out onto a slightly oiled work surface and divide into 8 equal pieces. Roll out each piece of dough into a 24-inch rope. Cut dough into 1 inch pieces and place onto the parchment-lined half sheet pan. Place the pretzels into the boiling water, 10 at a time, for 30 seconds. Remove them from the water using a large flat spatula. Return to the half sheet pan, brush the top of each pretzel with the beaten egg yolk and water mixture and sprinkle with the pretzel salt. Bake until dark golden brown in color, approximately 12 to 14 minutes. Transfer to a cooling rack for at least 5 minutes before serving. In a bowl microwave cream cheese for 45 seconds or until extremely soft and smooth. Stir in beer, horseradish, garlic, chipotle and salt. Microwave again for 45 seconds and gradually stir in the shredded cheese a little bit at a time. Microwave again as necessary to just barely melt the cheese and make the sauce smooth. No, this isn’t a ticket to the “gun show”… This is one of those dishes that you usually see in upscale restaurants. But you can make this at home, cheap and easy. The first time I had mussels was at a little French restaurant in Bethesda, MD. The salty and meaty taste of the mussels themselves, along with sopping up an entire loaf of French bread in the broth almost made my appetite for the main course go away (almost). Per usual, I decided I could make these at home for a lot less money, and just as tasty! You can serve these as an appetizer, or main course, setting the big pot you cooked them in at the center of the table and fighting over space to sop your bread in. 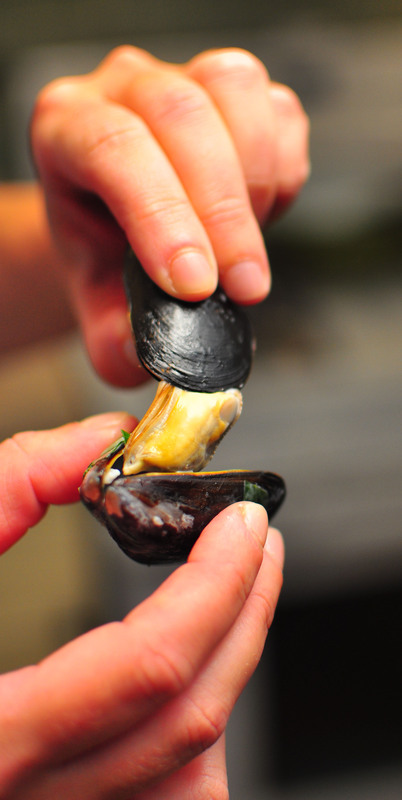 The most challenging part of cooking mussels is, well, buying them. This is one item that I will go the extra mile to find as fresh as possible. You may see them in plastic net bags at your regular grocery store, which I usually find many of them broken or dead. If you have a seafood counter with a guy nice enough to pick them out by hand, that is your best bet. Always cook them the same day you buy them and if you aren’t cooking them right away, put them in a bowl with a damp towel over them in the fridge. Regardless, DO NOT leave them in a plastic bag or you will kill ’em all (that is only good if you’re listening to Metallica). You can usually pick out the dead ones by their hollow sound when you tap them on the counter. Also, if they are slightly open, they should clam up when you tap on them. Before cooking, scrub them under running water and pull the little “beards” off. If any don’t open while cooking, discard those too. The good news is that these little buggers are only about 4 bucks a pound! I usually cook around 2 lbs for an entrée for two, or appetizer for four people. The most expensive part of this will be the wine you cook them in (if you buy “cooking wine” I will haunt you every time you do it). Just get wine that is good to drink too, please! 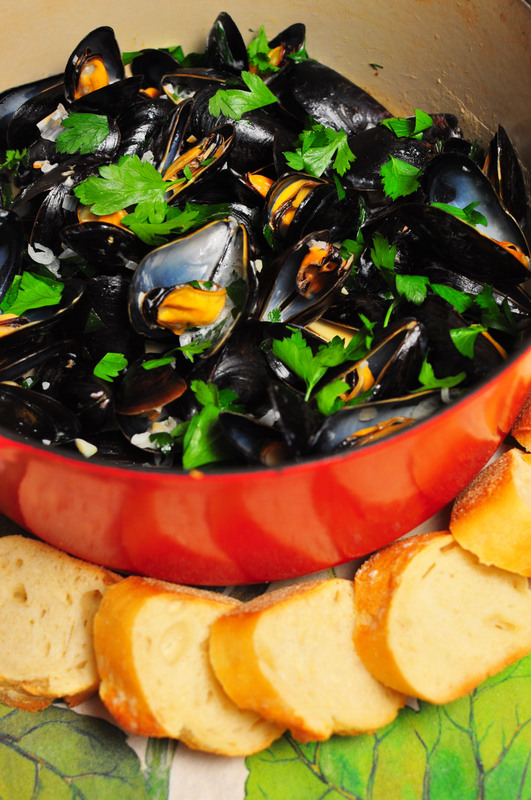 Recipe for steamed mussels: For 2 as an entrée or 4 as an appetizer. No silly little forks needed! In a large dutch oven, melt butter and saute shallots until soft over medium heat, add garlic and cook 1 more minute. Throw in the mussels, wine, cream and parsley and once it starts to steam up, put a lid on it (a clear lid is great to see as they open up). 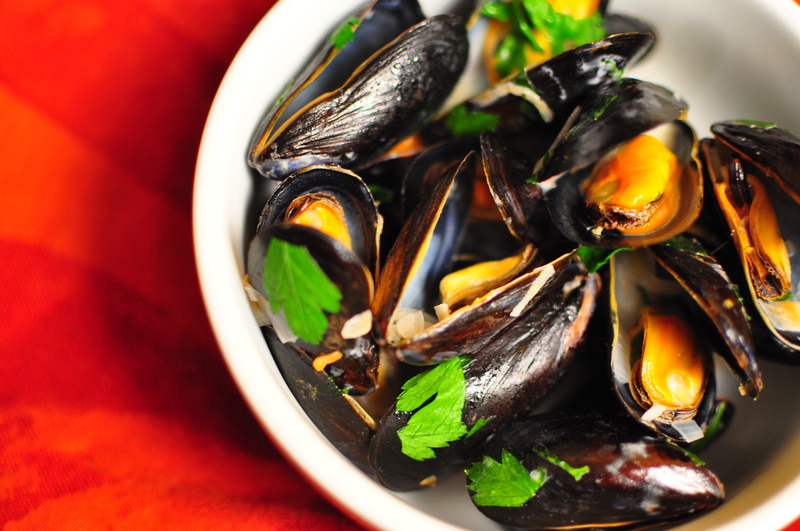 Check them after about four minutes and take the mussels out as they open and place in a bowl. If after 9 minutes any are still closed, throw them away. Maintain heat for a high simmer until your sauce reduces a little bit (about 5 minutes). Taste it as you go and don’t add salt until the very end (the mussels are salty and reducing the liquid will also make it saltier). Take your cooked mussels and any juice they let go along with the broth and pour it all into a serving bowl (or the pot you cooked in). Garnish with more parsley and fresh pepper. A perfect game day snack (as in futbol or football) at your house or on the go. I have pre-made these up to a day ahead and just borrowed the oven wherever the party is. In a large mixing bowl (or bowl of your stand mixer), throw in cream cheese, parmesan, garlic powder, onion powder, chipotle, oregano and pepper. Meanwhile, in a small non-stick skillet over medium low heat, cook pancetta until it browns and the fat renders out. Remove pancetta with a slotted spoon and toss in the mixing bowl with the rest of your ingredients. Now, with the leftover fat from the pancetta, cook the shallots until barely softened (3 minutes), add in garlic and cook for one more minute. Remove shallots and garlic to a paper towel to get the excess grease out and then add them to the mixing bowl. Stir together well to incorporate the ingredients and taste for saltiness (the pancetta is very salty, so be careful). You can leave this filling as is, in the fridge for a couple of days if you’d like. Pop out stems and clean your mushrooms. 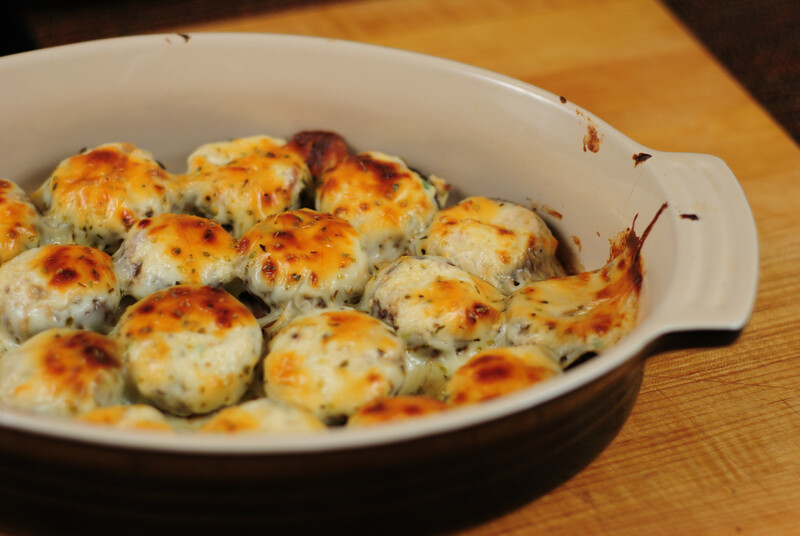 Spoon your filling in until it is slightly mounded over the tops of them and place in a baking dish. Once your shrooms are all filled, cover them with overlapping pieces of the provolone (we want the cheese to melt down the sides too!). This would be where I’d stop and take them to a friend’s place. Preheat oven and bake at 350 degrees for 15 minutes, then broil until the cheese browns (watch this part VERY carefully, really, don’t leave the oven). Once nicely browned, sprinkle a little extra oregano on top and let cool for 10 minutes. Guten Appetit! Get Skinny With It – The story of 5 ladies living healthy and happy. Sign up to find out when I blog next!